Today we left for Waitomo at 3pm and at 6:30pm we arrived at the Waitomo Caves Top 10 Holiday Park. The town was very deserted but we still decided to walk around and see if there was anything interesting going on. After 15 minutes we realized that in the “town” there was only a closed supermarket and a pizza place that closed at 8pm. We were all hungry so we turned around and headed back to our backpackers. Kate and Eugene, Kate’s son, joined us on the trip and when we got back they had already started preparing dinner. We all washed our hands and joined in around the table. I was in charge of cutting the cheese, lettuce and tomatoes while others set the table, cleaned our dishes and aided Eugene in cooking the burgers. The burgers were delicious and all of our plates were cleaned in three minutes. We sat around the table digesting the food we just inhaled and once we were semi-out of our food comas Eugene brought out his Pavolva. This Pavolva was even better than the one we had at the Maori dinner in Rotorua and I am very excited to go to Kate’s house to get the recipe and bring this mouthwatering dessert back to the States. After we washed our dishes, and the table, we headed back to our rooms. The seven girls were in one room and the five boys were in the room next to ours. We were all pretty tired so the ladies had a girl’s night and stayed up getting to know each other better. The conversation began drifting off, as did all of us into a deep sleep. At 8am Kate came in to wake us all up for breakfast before we had to leave our home for the night. When everyone was refueled we set off for the starting point of our Waitomo Cave experience which was a 5 minute drive from the backpackers. Once we got there we were required to sign our lives away, in case anything happened to us on the adventure we were about to take on, and then we went down towards the changing area. We were each gifted with a very hefty-duty wetsuit and we wandered into the changing rooms to attempt to shove our bodies into them. The wetsuits were already wet and cold making them extremely heavy and even more difficult to put on. They had knee and elbow pads for protection, and only one small hole to squeeze through. After a lot of jumping and pulling, I finally got mine on and was ready to go. It was a 10 minute drive to the start of the caves and before we entered we were given a safety and preparation speech by Roy, our cave leader. That would be me giving the thumbs up sign. We then had to stand on a wooden plank over the water to simulate what it would be like jumping off of a waterfall inside of the cave. I put my bum in the tire float and was told to jump out, not up. I was very scared and needed to be yelled at before I had the courage to jump. A half of a second in the air before I plummeted into the freezing cold water, when my float pushed me up to the surface I gasped for air and let out a painful scream to alert my friends that the water was the coldest I had ever felt. I now understood the need for the thick wetsuits. After we each got our turn jumping into the water we walked down to the entrance of the cave. We had to shimmy down a couple of large rocks, then turn our lights on and feel our way around and find a seat before we moved on. Once we were all inside we each introduced ourselves and learned a little bit more about the limestone cave we were crawling through. We were asked not to put our hands on the rocks as we walked through because the oils on our hands are harmful and leave discolored patches in the cave. Then our three hour cave crawling, waterfall jumping, and tube riding adventure began. We quickly hit deep water and in an assembly line followed each other’s steps up and down the uneven cave floor. We were again prompted to stop and take a seat in a very narrow part of the cave. We were all given a chocolate marshmallow fish and instructed to turn our headlights off. When all of our lights were off the cave was glowing from the worms on the ceiling. It was amazing to see all of the dots of light come together to make it bright enough that we could all see one another. We enjoyed our treat and learned more about the life of a glowworm. After we were all educated, we continued on and reached our first waterfall. Now was the time I had to take what I just practiced and put it to the test. I was third up and terrified of the rocks all around me but I leaned back, jumped out and the same shocking expression when I hit the water last time was no different now. I gasped for air and moved out of the way for the next jumper. After we all jumped we got into a line, grabbed the person behind us by the ankles and started peddling. Again we were instructed to turn our lights off and the glow worms were shining again. If you have ever been on the ride Space Mountain in Magic Kingdom park of Disney world, it was just like that ride when the stars light the black sky. Although we were all shivering from the cold water, I have never been more relaxed or amazed in my life. We were able to enjoy the magical view for about 15 minutes before the water got rocky and we were forced to abandon our tubes and begin climbing the rocks again. When we reached the end, I was so sad that it was over and I so badly wanted to do it all again. We packed back in our van, and drove back to the main site to rid ourselves of our wetsuits, grab a hot shower, and some soup to warm up. I was shocked and relieved that getting out of my wetsuit was easier than getting it on; so excited I ran to the shower to be surprised that they were out of hot water and a cold shower was the only option. I took it. After changing into dry clothes I hurried to the warm soup, filled up a cup, toasted a bagel and chowed down. When we were all warmed up we loaded the cars and drove towards Raglan, stopping at Waireinga Leaping Waters on the way. I was exhausted after our busy morning and was not prepared for a hike but Waireinga is a 55 meter waterfall and I could not pass on the opportunity. It was a 15 minute hike down to the bottom, and after a couple of pictures and a lot of fresh air we headed back up. Another hour of diving and we finally reached Raglan, our destination for the evening. We stopped in town for a quick snack and then went to our next backpackers Karioi Lodge which was 15 minutes away from the town center. At Karioi Lodge we were given a quick introduction to the premises and then we went up to our rooms, dropped our packs and hung out in the communal area until dinner time. At 6pm we went back into town for dinner. Initially we were going to eat at a shack over the bridge that is known for its fish and chips. It was a very small place, and I was intrigued by the menu but they were not taking orders for another hour so we decided that we were going to try and find someplace else. We walked over the bridge into town and priced out almost every restaurant in the town before settling on Vinnies. We sat upstairs, on what felt like a sun-porch and the atmosphere was very welcoming, bright and fun. Everyone was very happy with their meal and once we all felt stuffed we searched for Kate and Eugene to go back to our backpackers. I really enjoyed staying at this backpackers because it was very quiet around the living areas, but the communal area was bumpin’ with music and people from all around the world. We had the opportunity to meet a lot of very interesting people and once it reached 11pm (quiet hours) we all headed up to a barn. The barn was filled with couches, ping pong tables, a bar area, and a large radio. Although no one else was ready to call it a night, I grew very tired and headed back at a reasonable time. I knew surfing tomorrow would demand a lot of energy and I wanted to be as prepared as I could. Today I grew one step closer to facing my biggest fear: sharks. 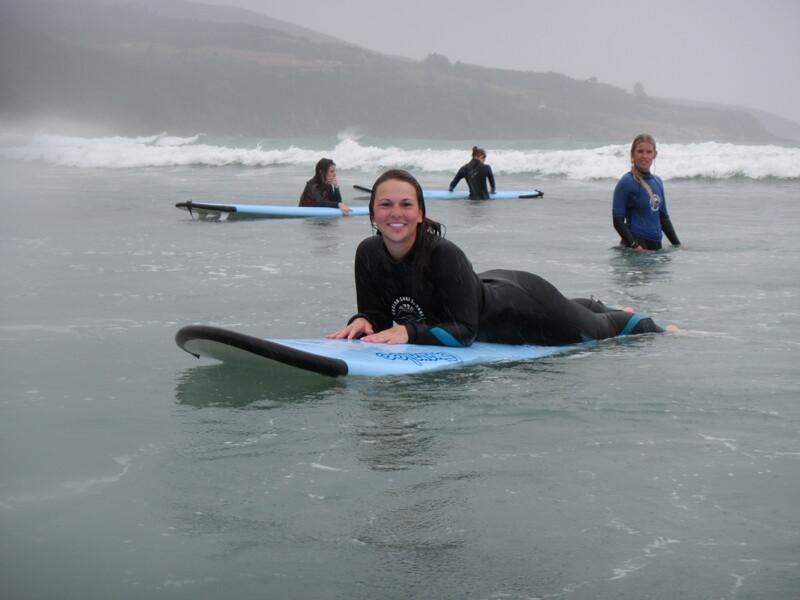 Since the first day of Orientation, when I learned we would be going surfing, I was terrified. I had been flip-flopping since then whether I would have the courage to try. At 8am we headed back down to the barn for an orientation to surfing. We practiced the four steps for getting up and when we were all ready we drove down to the water. It was a miserable rainy day, but the black sand and emptiness of the vast beach was very quaint. After forcing myself into yet another wetsuit I was one step closer to having to go into the water. I grabbed my board, secured it around my ankle and set off. One of the instructors, Ryan worked with me for a while and after a couple of tries I was able to stand. But without fail, every time I did stand I got so excited I threw my arms up in excitement, completely tipping my balance and I crashed down into the water. It was very rewarding when I got up because I never thought I would be able too. We were in the water for three hours, in pouring rain, and I did not feel cold once. It was so much fun jumping over the huge waves with my board, sometimes being knocked down by them and then standing up in confusion. It was also very entertaining watching everyone else stand up on their boards and seeing how excited they were. 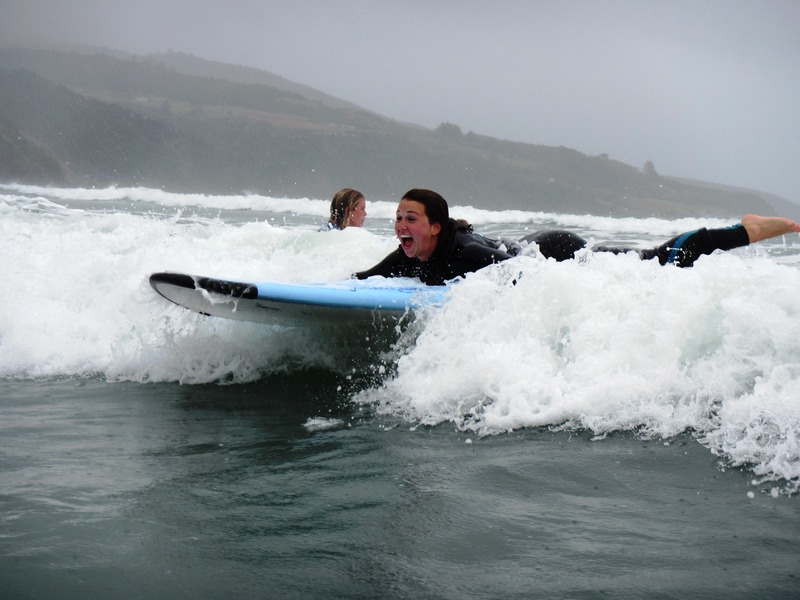 I am so grateful Arcadia gave me this opportunity because unless forced, I would never have the courage to go surfing. Once our lesson was over we were all sad because that meant our unforgettable weekend trip was over. We all changed into dry clothes and packed back into the car, only minutes went by before we were all rocked too sleep by the car curving and turning around the mountains.